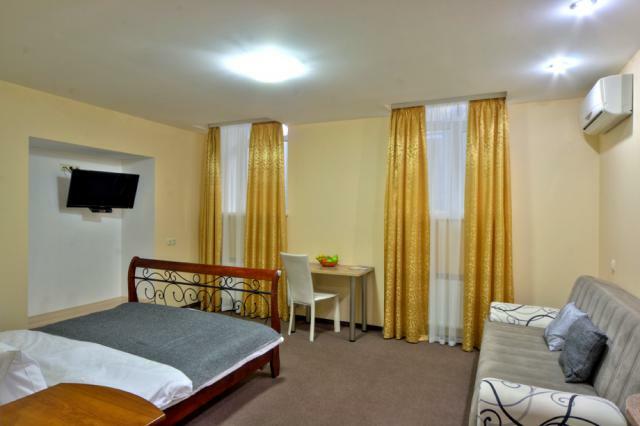 If you are looking for a modern and comfortable hotel in the historical centre of Kiev - Golden Gate Inn apartments is at your service. 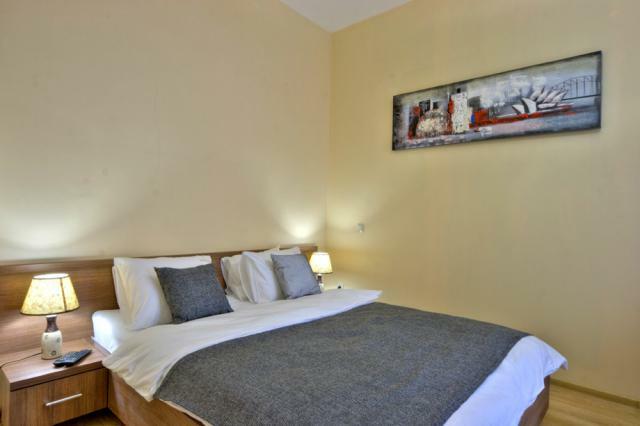 Golden Gate Inn has the Euro-class status and at the same time is affordable. Golden Gate Inn is just 800 meters from the Golden Gate metro station, 15 minutes walk to the Opera House, St. Sophia's Cathedral, St. Michael's Cathedral, the central Khreschatyk Street and Independence Square. Golden Gate Inn has English-speaking staff, every guest is guaranteed a high level of service, comfortable apartments, self-catering, cleaning everyday, non-stop reception, parking, Wi-Fi. Cordiality and hospitality is our passion! The room have double bed, built-in wardrobe, sofa, LCD TV, satellite TV, a/c, wi-fi. Room have bedroom and separated kitchen. The room have double bed, built-in wardrobe, sofa, LCD TV, satellite TV, a/c, wi fi. Room space is 22 square meters, includes bathroom. Room space is 22 sq. m. includes living room and bathroom. The room has double bed, dresser or built-in wardrobe, LCD TV, satellite TV, a/c, wi fi. It was perfect! Staff and the location - really nice. 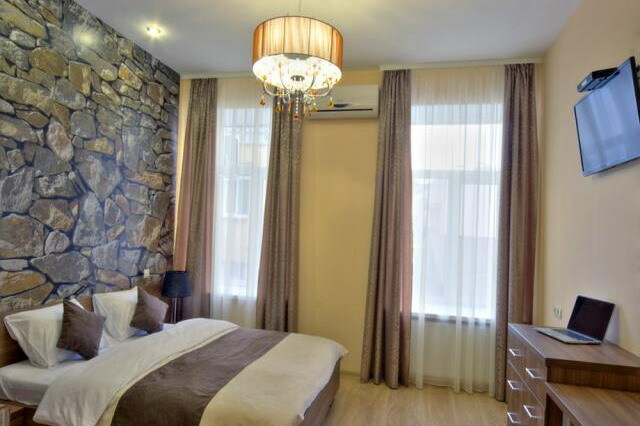 The location was in walking distance of my meetings and central to various Kyiv attractions. The hotel room is equipped with small fridge, microwave, dishes, cutlery and kettle. The location is great, there are many good and cheap restaurant in close relation. Staff are really kind. The central heating not so good, but this usually in Kiev, I think. Responsive staff, good-size room, good wifi, clean bathroom with good facilities. Gives what it says on the tin. Good location, 10-15 minutes from the subway. Clean, comfortable, quiet. In the room there is all you need to stay. Great hotel. Modern, very comfortable, small, located in a quiet courtyard. Fridge, stove, kettle and a set of necessary utensils in the room. Not far away from the metro station "Golden Gate". Attentive and friendly staff. We had a very good experience staying in this hotel. The room was huge and clean. The location is just perfect. The administrator was super friendly. I would highly recommend this place. Chambre agréable et très propre. Excellente situation, très bon quartier. Un excellent rapport qualité-prix. Recommandé pour voyage d'affaire ou personnel, long ou court séjour. Liked everything: great location in the city center, great staff, great attention to detail in a hotel room, which has everything for even cooking homemade food. Like a perfect cleanliness and double door to the room safe available. And like a very reasonable price with such a high quality of services. Were pleasantly surprised by the value for money. 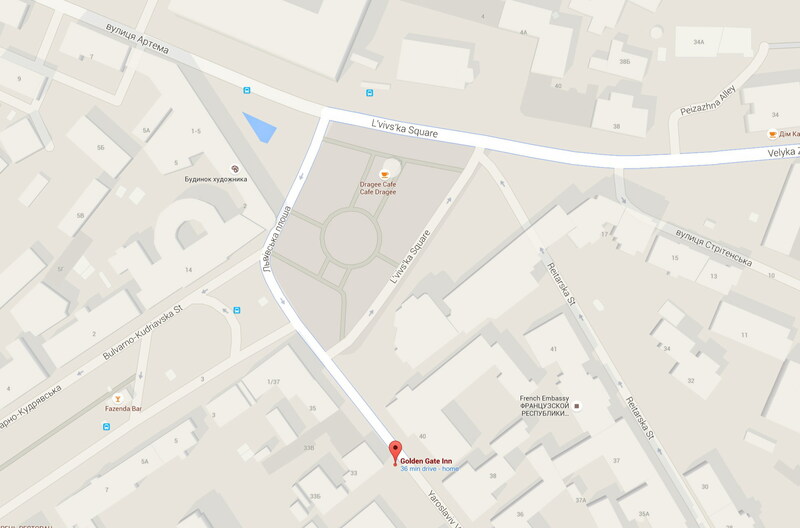 The hotel is located very close to centre of city .Close by many restaurants and shops. The wait staff is polite and friendly. Clean Rooms feature kitchenettes We loved it. The apartments have a lot of space. The beds are nice and the room is very clean. The kitchen is a nice addition if you want to make some food yourself. The location is good. 1 minute from a supermarket and 10 minutes walk from the metro station. Cozy hotel in the city center. Near the famous sights of Kiev. Cute and helpful hotel staff, always ready to help guests. 28/03/14 - Sauna in the hotel. In our hotel, Golden Gate Inn, we opened for our guests a sauna. Sauna is quite roomy, has a shower, sitting area, TV, wi fi internet. 13/03/14 - Breakfast to the Room. Our Hotel in Kiev Golden Gate Inn offers to our guests a new service – breakfast to the room. Upon arrival, each guest can get acquainted with our menu and order breakfast. The breakfast will be brought to the guest at convenience time. 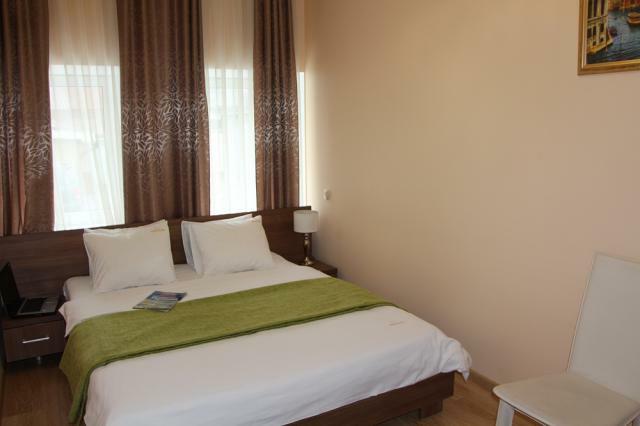 GoldenGateInn is a modern complex of apartments in the historical city centre, within walking distance to the main Khreschatyk street. Next door to the hotel are the main attractions, theaters, restaurants, shopping malls and business establishments of the city. GoldenGateInn is pleased to provide you with 24 rooms, with modern design, with a kitchenette, air-conditioning, LCD TV with satellite and free Wi-Fi. Hotel GoldenGateInn gaining popularity due to the low price,comfortable atmosphere and friendly staff.